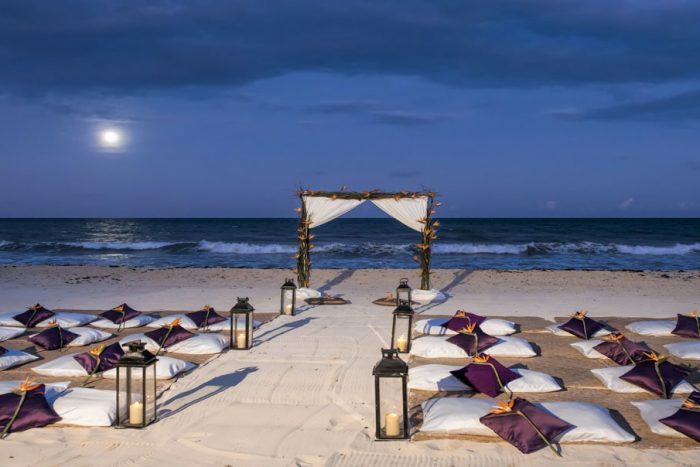 The Iberostar Paraiso Beach resort sits along the northern coast of Mexico’s famous Riviera Maya on the Playa de Punta Maroma beach, which is a mile-long stretch of gorgeous waters and velvet sand to walk along, or to hold your wedding ceremony on. Iberostar Paraiso Beach offers one of the largest pools in the Riviera Maya, that winds through the resort between “islands” with decorated cabanas where you can sit back and relax. 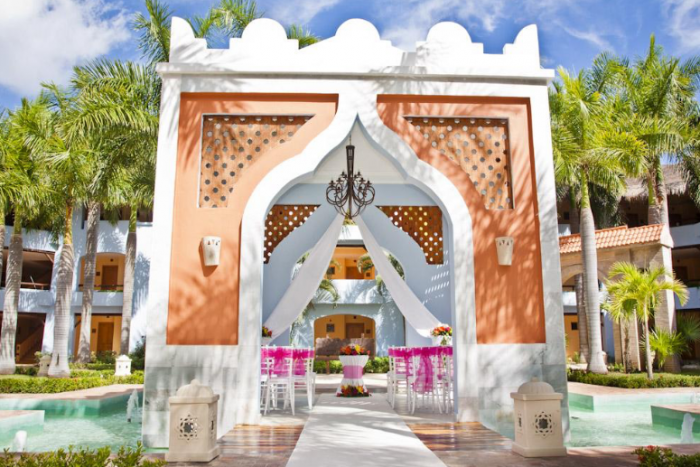 The resort has Mexican colonial-style decor with an authentic Mayan feel, surrounded by expansive ground covered in local flowers and plants to make your Iberostar Paraiso beach wedding as beautiful as possible. Perfect for animal lovers, as local wildlife like swans, peacocks, flamingos, and lizards can be seen all around the resort. There is a special romantic jacuzzi hidden underneath a waterfall at this resort. 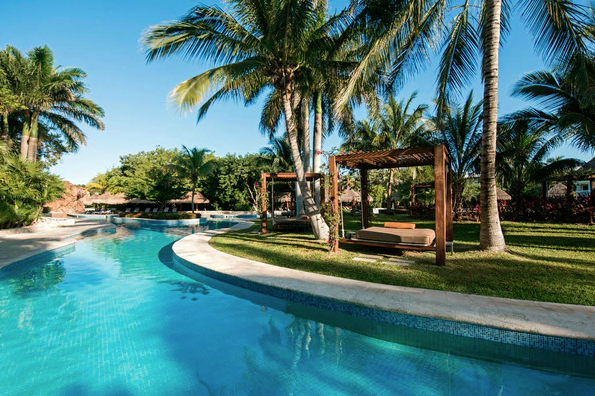 While the resort offers many romantic options, they also include an 18-hole golf course, target shooting, archery, yoga lessons, and scuba diving lessons. The base price for this package is $999 and guests must stay at the resort for a minimum of 3 nights. Upgraded packages, additional guests, and add-ons are available for an additional cost. The resort will host no more than 1 wedding per day, Monday thru Saturday. The wedding coordinators typically respond within 1 full business week. During the resort’s busy season, they may longer. Rooms range from $130 – $220 per person per night. Every room includes wifi and a minibar. Superior rooms and all higher room categories include complimentary access to the spa’s adults-only wet areas. Children ages 2 and younger stay free. There are 388 total guest rooms with views of the garden, jungle, or ocean. Handicap accessible rooms are available upon request. High-season months typically include May, June, and July. It is always encouraged to have your guests book their stay 6 – 8 months in advance, as the resort can sell out during these months. All rooms allow up to 2 adults and 2 children max, or 4 adults max. The family rooms are the only room categories to hold up to 6 adults max. Children are ages 12 and younger. Iberostar Paraiso Beach is located about 20 miles from the CUN airport. The resort is about 25 minutes outside of downtown Playa Del Carmen. There are 388 total guest rooms with views of the garden, jungle, or ocean. Handicap accessible rooms are available upon request. 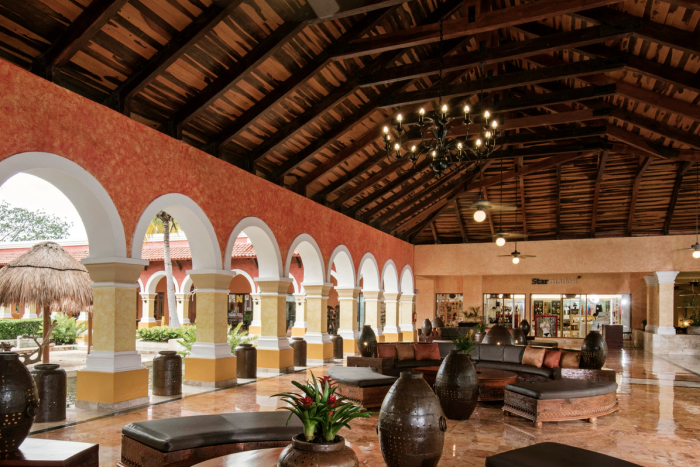 Guests have daytime access to neighboring Iberostar resorts in the area for exchange privileges. Iberostar Paraiso Beach is located 20 miles from the CUN airport. The resort is about 25 minutes outside of downtown Playa Del Carmen. A: That we have the opportunity of know different cultures and traditions. Weddings are full of every kind of emotion, and to personally see the face of the groom when his bride is getting closer to him is the best part of every wedding. 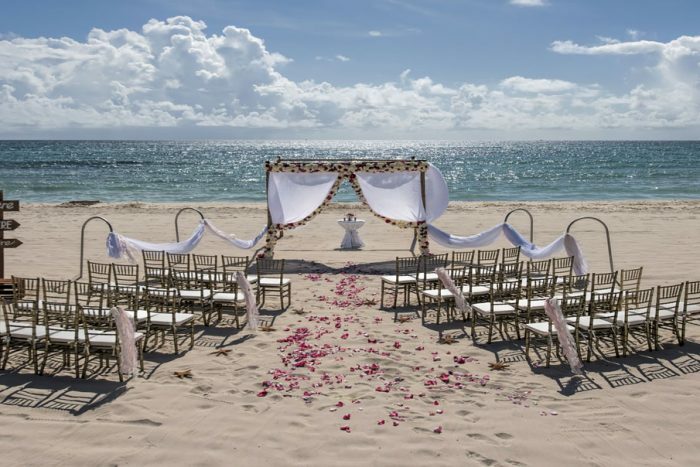 Q: What makes Iberostar Paraiso Beach a great place for a destination wedding? A: The Resort has a half mille of beach where the guests can enjoy the beauty of the Caribbean seas. We have more than one wedding location per hotel, with different venue options to offer. The resort also has a shopping center where we have a Catholic Chapel for catholic ceremonies. At the shopping center we have multiple restaurants that are part of the additional services that our guests can have as part of the all-inclusive. Q: What are the challenges brides face when planning their destination wedding at Iberostar Paraiso Beach? A: Challenges could be that we have one wedding per hotel, which limits date availability. Another thing could be a private reception on the beach must end by 11pm.